The first Hennebery in Ireland was Philip de Hynteberge, lord of the manor of Rath, County Dublin, in 1250. He was part of the Norman military aristocracy sent to control Ireland. The surname became known as de Hionburgha in Gaelic and became anglicized to Henebry/Hanebry/Henneberry in the 15th century. The family migrated to Counties Kilkenny and Waterford, and later some family members moved to Counties Limerick and Tipperary. A report on surnames from the 1890 birth indexes lists 13 Henneberry births. Two of the births were in the province of Leinster and eleven were in the province of Munster (Tipperary and Limerick). This Henebry family is from the Glen of Aherlow, near Galbally, County Limerick, Ireland. Tracing your Irish Roots is a difficult task. Most of the Irish census records have been destroyed. Extensive research in Ireland and America, provides some early information. (Go to the site menu to visit the web pages on the origin of the surname, the church records in Galbally and the village of Galbally). David Henebry: born about 1730 near the Glen of Aherlow. William Henebry: 1760-1830. Son of David, buried near Clonbeg Church in the Glen of Aherlow. (see below). David Henebry (1797-1849) born in County Limerick, Ireland. The oldest son of William. Arrived in America in June 1848. Buried in the Clonbeg Church graveyard near Newton in the Glen of Aherlow. Dean & Rector: Dr. P. N. Knowles: The Deanery, Cashel. "Sacred to the memory of Thomas Henebry of Drumleigh who dept'd this life the 23 of June 1843 aged 63 years also his son Thomas dept 19 dec 1843 aged 23 years. Erected by his son James Henebry for them & posterity." "To the memory of William Henebry of Kilscanlen Who dept this life the 13th of April 1830 aged 70 yrs. Erected by his sons David, Michael & James Henebry for him & their posterity. May he rest in peace." Above: William Henebry of Kilscanlen; Kilscanlen is just south of Moorabbey in the Glen of Aherlow. The Clonbeg church is located near Newtown, which is about five miles east of Galbally. Click here for photos of the gravestones. Glabally and Kilscanlen are in County Limerick. Newton and Moorabbey are in County Tipperary. This is why you will find some family members born in Limerick, and others only a few miles away, born in Tipperary. Information on the Knowles surname in Ireland. The Henebry, Magner, Bresnan, Fogarty, Kiely, Cussen, Hayes, Ryan, Foley and Fruin families all lived near the Glen of Aherlow area in Ireland. 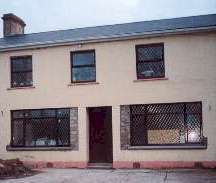 Galbally is located only a few miles from County Tipperary and County Cork. After these families emigrated to America, many of them settled in Illinois. Information provided by the Genealogical Office of Ireland. Tithe Applotment Books, Civil Parish of Galbally, 1830. Griffiths Valuation, civil parish of Galbally, 1852. A townland is not a town, does not have a government, and is the smallest administrative unit in Ireland. The boundaries of the townlands were officially surveyed in the 1830s by the Ordnance Survey. Due to their small size townlands do not usually appear on standard road maps. In the United States, townships are also geographic areas, example Dora Township in Illinois. Further complicating genealogy searches, some individuals in Ireland and America gave their place of birth as a townland or a township. Father of David is William Henebry (1760-1830) and mother is Margaret; based on tradition of naming first male child after the husband's father, and naming the first female child after the wife's mother. At the time of William's birth, the French & Indian War was being fought in the American colonies. Brother of David is James Henebry, wife Elizabeth. They were godparents of David's oldest daughter Margaret. Margaret Henebry born August 4, 1823. She was baptized in Galbally, County Limerick, Ireland on November 7, 1823 at the Church of Christ the King. James owned land in County Limerick, Parish Galbally as did brothers, Thomas and Michael. David was a member of the Catholic Association of Ireland. The English Penal Codes and the Treaty of Limerick forced Irish Catholics to contribute to the Church of England and prevented them from voting. David's cousin, Daniel O'Connell (the Liberator, 1775-1847), was influential in obtaining a political position for David in County Tipperary. David owned several Inns (lodging houses) in the Galbally area. After the imprisonment of Daniel O'Connell in February, 1844, political pressure increased and David and his family fled to the United States. Mt. Olivet cemetery in Wilmington, IL. Parents of Jane were James and Honora (Cussen) Cushing. James died in 1858 in Illinois, and Honora died October, 1849 in DuPage County, IL. Mt. 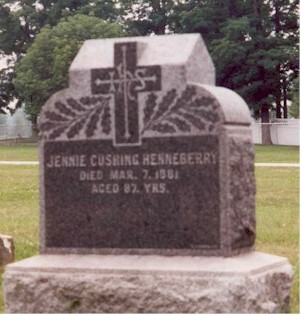 Olivet Cemetery: Jennie Cushing Henneberry, Died March 7, 1881. Aged 87 years. David died of cholera in Illinois. He is listed in the 1850 Grundy County Mortality Schedule and is probably buried in the Wauponsee Township Cemetery in Grundy County, IL. Along with eleven of their twelve children and twenty seven other relatives including members of the Ryan, Kiely and Cushing families, David & Jane left Cork, Ireland aboard the Ship Argyle and landed in the Port of New York City on June 17, 1848 (see complete passenger list of the Argyle on site menu). Some of the family members settled in New Jersey, Brooklyn, New York and Waterbury, Conn. Most of the families traveled west and settled in DuPage, Will and Grundy counties in Illinois. In 1850 most of the family was living in Braceville in Grundy County. Since Braceville is only nine miles from Wilmington in Will County, several grandchildren were born in Wilmington rather than Morris, the county seat of Grundy County which is about 22 miles away. Other Henebry's aboard the Argyle: William - age 23, (Passaic Fire Department 1877? ), John - age 20. James-age 30 and Ellen Henebry-age 25: with children: Bridget - age 4, Thomas - age 2, Michael - infant. William, John and James could have been the younger brothers, nephews or cousins of David Henneberry. Henry age 20 and Bess are probably married and he is a nephew or cousin of David. When David was born c. 1797, John Adams was the second president of the U. S. When the Henebry family arrived in New York in 1848, James Knox Polk was president, and there were 31 states. The population of the U. S. was 23 million, about nine percent of the current population. The Mexican War had concluded with the Treaty of Guadalupe-Hidalgo ratified by the Senate on March 10, 1848. Abraham Lincoln was finishing his last term as congressman. Lincoln returned to Springfield to renew his law practice in early 1849. Why did the family move to Illinois? The construction of the Illinois and Michigan Canal brought many Irish to Illinois. In 1823, the new state of Illinois created a canal commission. No progress was made until a second commission was formed in 1835 with a federal grant of 284,000 acres. Most of the land was offered for sale at $1.25 an acre, but sales were slow and further problems arrived with the economic "Panic of 1837". Construction started in 1836. As funds became scarce, the laborers were paid in scrip. As the scrip became devalued, land was offered in exchange for the scrip. Many of the Irish workers became landowners and other workers sold their land to the new immigrants. Irish settlements were developed along the canal route in the counties of Cook, Grundy, LaSalle and Will. "American History texts" written mostly by the English would have us believe that the Irish and other immigrants were ignorant, poorly educated and lazy. More intelligent research indicates the opposite. The Irish engineering, surveying, political and financial talents provided the impetus to complete the canal. Michael Ryan, an engineer and Illinois State Senator, went to London to negotiate a loan of $1,600,000. This loan made possible the completion of the canal. The canal was finally opened in 1848. The exchange of land for work enabled the establishment of Irish settlements from Chicago to LaSalle and extended south to Peoria. The Cussen family, relatives from Galbally, are believed to be the first to work on the canal, and sent word back describing the opportunities for good, inexpensive land available in Illinois. James Hennebry purchased canal land on September 11, 1848. Thomas, Bess, James, Elizabeth, David, Michael, Patrick and Bridget. William was probably living on the next farm with his wife Mary. No record exists for Francis, Henry, John or Garrett in this census. Francis was living in Moultrie County in the 1880 Illinois census. John was living in Will County in 1870. Henry could have moved to Missouri and Garrett to Montana. By the mid-1870's, James, Patrick, Francis and Margaret had settled in Moultrie County near Dalton City and Bethany, IL. By the mid 1890's, Patrick and Francis had moved to Iowa. Confusion regarding spelling of surname. The Moultrie County death certificate for James is spelled Henneberry. The marriage certificate of 1862 is spelled Henebry. The death certificate for his wife, Elizabeth is spelled Henebery, and their gravestone is spelled Heneberry. Ship's manifests from the 1840's listed the name as Henebry, Heneberry and Henerbry. Landowner records in Ireland also have different spellings of the surname. Griffith's Valuation of Ireland, 1848-1864 lists 17 Henebry's, 3 Henebery's and 15 Heneberry's. The Catholic Church in Bethany is spelled as St. Isadore and as St. Isidore. The Grundy County Illinois census lists the surname as: Henebry in 1850, Heneberry in 1870, Henneberry in 1880 and Hennebry in 1900. Ship's clerks, census takers, newspaper reporters and others appear to have used "phonics" to spell names and places. Dates and obituaries were also subject to errors. The first Hennebery in Ireland is claimed to be Lord Philip Hennebery, an English landowner. He had a castle and land in County Meath outside of Dublin in the 13th century. We have a record for Maurice Henebry of County Limerick, the Diocese of Cashel. His will was made in 1739 and probated in 1760. See Details on the Origin of the Henneberry Surname.